The bulb of the thermometer should come in good contact with the object or dip well in the liquid whose temperature is being measured. The thermometer should not touch the wall or sides of the container. The thermometer should be held vertically. The reading of mercury level in the capillary tube should be taken by taking the reading of the upper meniscus of mercury, keeping the eye on level with the meniscus. A mercury thermometer is used to measure the temperature of extreme hot places. 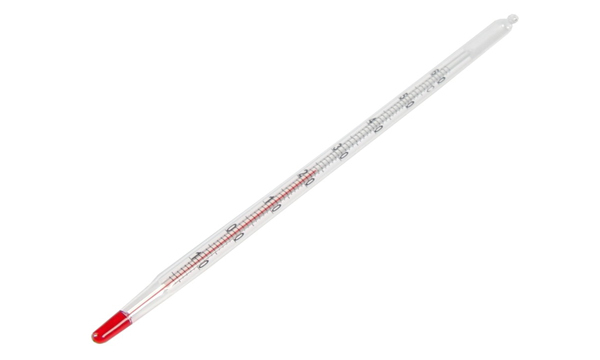 Mercury thermometer can measure the temperature of -390 Celsius to 3570 Celsius. It does not stick to the wall of the glass tube. It can be used for a wide range of temperature. An alcohol thermometer is used to measure the temperature of extreme cold places. Alcohol thermometer can measure the temperature of - 1120 Celsius to 78.30 Celsius. It is transparent; therefore, it has to be coloured before it is used. It has low specific heat capacity. It expands more than mercury (about six times) for the same rise in temperature. Alcohol freezes at - 1120 Celsius and boils at 78.30 Celsius. Marking of temperature scale on a thermometer is called calibration. Calibration is done in two ways. By marking two fixed points i.e. lower fixed point and upper fixed point. By dividing the interval between the lower and the upper fixed points either in 100 equal parts and labelling each part as one degree Celsius in Celsius scale or in 180 equal parts and labelling each part as one degree Fahrenheit in Fahrenheit scale. Lower fixed point:The lower fixed point is the temperature of melting point of pure ice at standard atmospheric pressure of 760 mm of mercury. Upper fixed point:The upper fixed point is the temperature of the steam produced from the pure boiling water at the standard atmospheric pressure of 760 mm of mercury. It is used to measure the temperature of the body. It is used to measure the temperature of a room. It is used to know the temperature of the water of an aquarium. It is used to know the temperature of the human body and environment. A device, which measures the temperature of a body, is called thermometer. 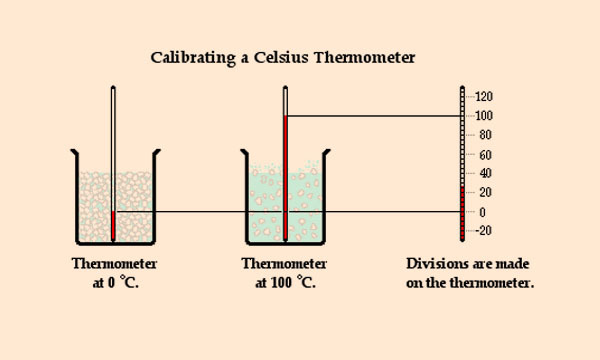 Three temperature scales are used on thermometers: the Celsius, the Fahrenheit and the Kelvin scale. There are two types of thermometers according to the thermometric liquid used: Mercury and Alcohol Thermometer. Mercury thermometer can measure the temperature between -390 Celsius to 3570 Celsius. Alcohol thermometer can measure the temperature between - 1120 Celsius to 78.30 Celsius. Give the reason why alcohol thermometer is preferred for a very cold region. Alcohol thermometer is preferred for a very cold region because its freezing point of alcohol is - 117°C. So, it can measure the temperature of the very cold region. Give the reason why the temperature of boiling water can’t be measured using an alcohol thermometer. Temperature of boiling water can’t be measured using an alcohol thermometer because the temperature of boiling water is at 100°C and that of alcohol is 78°C . So, alcohol boils before water and can’t be measured the boiling point of water. Give the reason why constriction is made in a clinical thermometer. Constriction presents in a clinical thermometer let the level of mercury increase when the temperature increases but doesn’t let it fall when temperature decreases and it helps to take the correct reading. A clinical thermometer is jerked before using it. A clinical thermometer is jerked before using it to bring the level of mercury in the bulb. Give the reason why steel pointers are used in maximum and minimum thermometer. Steel pointers are used in maximum and minimum thermometer to locate the temperature of the region. Write the importance of thermometer. A clinical thermometer is used in the clinic or home to measure the temperature of human body. A laboratory thermometer is used in the laboratory to measure the temperature of a different substance. Maximum and minimum thermometer is used to measure the maximum and minimum temperature of the region. On what principle is a thermometer based? Thermometer is based on the principle of, ' when a body is heated it expands and when a body is cooled it contracts ’. If you have to measure the temperature above 80°C, do you use alcohol or mercury thermometer? Why? I use mercury thermometer to measure the temperature above 80°C because the boiling point of alcohol is 78°C . So, it can’t measure the temperature above 78°C. When is maximum and minimum thermometer used? Maximum and minimum thermometer is used when maximum and minimum temperature of a region is required. What are the advantages of using alcohol instead of mercury in a thermometer? The freezing point of alcohol is 117°C. Thus, it remains liquid to a very low temperature. Due to this reason alcohol thermometer is used for measuring the temperature in very cold regions. Its expansion rate is about seven times more than that of mercury. What are the disadvantage of using alcohol instead of mercury in a thermometer. It is colorless. Hence, it should be colored before use in order to see it easily. It is a bad conductor of heat. It wets the wall of the capillary glass tube of the thermometer. Its expansion rate is not uniform. Its boiling point is 78°C. So, it can’t be used for measuring the temperature above 78°C. Due to this reason the alcohol thermometer is not used to measure temperature in very warm places. Which thermometer do you prefer to measure the temperature of boiling water? I prefer to use laboratory thermometer to measure the temperature of boiling water. Which thermometer do you prefer to measure the temperature of the human body? I prefer to use clinical thermometer to measure the temperature of human body. 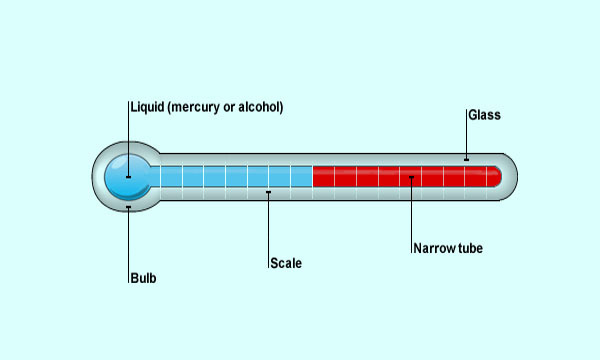 What are the advantages of the use of mercury in a thermometer? It is a good conductor of heat. It has uniform rate of expansion and contraction. Mercury does not wet glass. So, the rise and the fall of the mercury in the tube is clean and smooth. It has very high density, so a small bulb of a thermometer can contain much mercury. Mercury remains liquid state over a quite wide range of temperature because it freezes at 39°C and boils at 357°C. The normal temperature of human body is 98.6 Fahrenheit. Convert it to Celsius. Express 0o Fahrenheit into Celsius scale. Express 200 Fahrenheit into Kelvin. Express 100 Kelvin into Celsius. Convert -40 Celsius into Fahrenheit. Convert 200 Celsius to Kelvin. Which of the following is used to measure the temperature of very hot bodies? The S.I. (system de international) unit for common temperature measurement is ______ . The S.I. unit for temperature is ______. Which of the following is doctor's thermometer? Which thermometer is used to measure the maximun and minimum temperature of a particular place? 200 Celsius = ______ Kelvin. the shape of the clinical thermometer is made prismatic why? Any Questions on 'Thermometer '?